Monday afternoon in the All-American Room at Seward County, Saints righthander Adam Keller inked his National Letter of Intent, signing at a place in which he "always wanted to be" Wichita State University, to play for the Shockers next season. 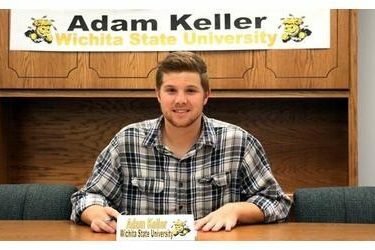 Keller hadn’t even thrown a regular season pitch for the Saints before signing with the Shockers on Monday. The Broken Arrow, Oklahoma native played his freshman season in 2015 at West Virginia University before transferring to Seward this fall. As a freshman for the Mountaineers, Keller logged 33 2/3 innings , ranking fifth on the team, while posting a 4.01 ERA across 15 appearances. He struck out 32 while walking just 11 and allowed opponents to hit just .256 against him. Keller is expected to be at the front end of the Saints starting rotation in 2016 after a successful, yet limited fall season due to a nagging arm issue. Keller will join a rebuilding Wichita State squad in 2016-2017 looking to get back to national prominence. The Shockers were just 26-33 in 2015, finishing under .500 in Missouri Valley Conference action for the first time since the school brought baseball back in the 1978 season. Historically, one of the top programs in college baseball, Wichita State boasts a resume second to none, including 7 College World Series appearances, 27 NCAA Tournament appearances, and 55 All-Americans. Keller and the Saints will begin their 2016 season on January 30th when they open up at home against McCook.